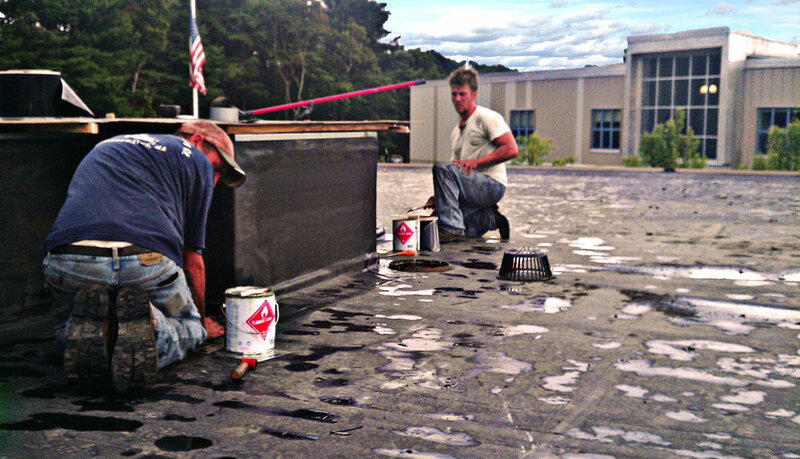 Flat Roofs — Kevin Lyman Roofing Co.
Kevin Lyman Roofing Co installs EPDM rubber roofs. There have been a variety of rubber roof styles developed over the years, but we have found fully adhered rubber roofs with Genflex products to be the most effective rubber roof available. First we install insulation with an r-value based on the requirement of the situation. Then, we use the highest quality roofing glue to fully adhere the rubber roofing to the insulation. We use this method overlaid on old roofs as a roof replacement, as well as for new roof installation. The construction of the building only changes our approach, as we are set up to install roofs over metal, wood, and concrete decks. Kevin Lyman Roofing Co also specializes in Installing and removing curbs for HVAC units. We just need to know where it goes, and we will make the roof penetration, install the curb, and of course, flash it in to be waterproof. If you need to remove an old curb we can do that too. We will remove the curb, replace the decking, the insulation, and give it a proprer long lasting weatherproof rubber covering. Give us a call today and we'll give you a free estimate on your project!